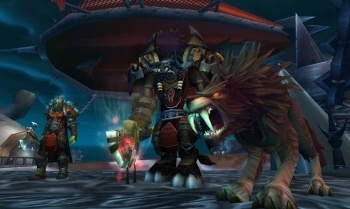 If you want to avoid being hacked in World of Warcraft, just pick up a phone. Blizzard has developed a new level of security for Battle.net accounts called the Dial-in Authenticator. Simply by using the common telephone, players of World of Warcraft will now be able to protect themselves behind a new wall of security. Battle.net users that sign up for the Dial-in Authenticator will be asked to call into Blizzard's hotline, a toll-free number, when something about their login attempt becomes unusual. They may be trying to login to a World of Warcraft account from a different computer than is normally used, or from a different country. After calling in, users will then have to enter a PIN plus a single-use security code displayed on the screen. Once everything is verified, the login attempt completes as usual. For now, the Dial-in Authenticator is only compatible with World of Warcraft accounts attached to a Battle.net account, and for Battle.net account management, though this may change in the future. It's a completely free service, but is currently only available in the U.S.
Blizzard points out that this new method of protection reduces the possibility of account theft from various common methods, such as keylogging. Anybody trying to beat the Dial-in Authenticator needs access to your phone and PIN number. Account theft has been an issue with MMOs since it was worth it to steal someone else's account, so it's nice to see Blizzard constantly devising new foolproof, or close to foolproof, methods to stop the online crime.